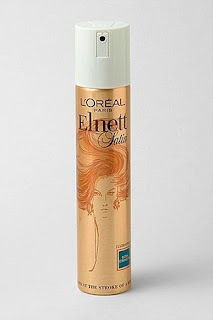 I am such a big fan of L’Oreal Elnett Satin hairspray for both myself and for work. The reason I love Elnett for myself because it gives exceptional hold while I work long hours. I love useing it on set because it doesn’t leave the clients hair stiff. And when I need to change the hair style the formula really disappears at the stroke of a brush leaving it soft and satin like…I know I sound like an ad but it’s a great product that I really love, I promise you will to. F.Y.I.—Some models mentioned that they were not a fan of the smell but I guess I am use to it that it doesn’t bother me. The price is on the wallet and will last you a long time because you really don’t need a lot. The ultra fine mist really holds any up do’s, soft body waves, and any short pixie cuts. This A-List hairspray can only be purchased at Target. Glam Life of Celebrity Makeup Artist...in New Orleans who now cover Los Angeles, Dallas, South Beach, and New York.